The Pickford brothers were completely bewildered. What Rare had asked was unprecedented, strange and curious. They'd never heard anything like it. Who'd make such a request? They were Brit veterans of 8- and 16-bit development with dozens of games in their softography, but they were talking to Rare about working on the NES. Rare had demanded something new. They'd explained that the games had to be complete-able. In fact, they required a video of it being played from start to finish to prove it. This was bizarre - developers didn't complete the games. Players completed the games, and someone overseeing that was unheard of. Half the time games just amped up the speed until either they broke or the players did. That's just how games were made. Or so Ste Pickford wryly describes the event years later in a recent blog post. In the years between then and now, there's been a fundamental shift in our expectations. 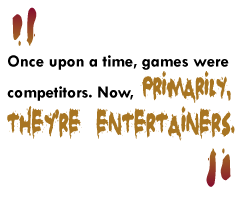 Once upon a time, games were competitors. Now, primarily, they're entertainers. They aimed to beat you. Now, to be beaten. Our language says much, really. While we've talked about difficulty curves forever, the problems now are "difficulty spikes." No one ever critiques a game for a difficulty-trough - because the former stops you getting anywhere and the latter is just something you coast through. Charting this progression is interesting - while the Nintendo approach to games as described to the Pickfords was a major change, one of the hardest lines in the sand was drawn a little later by LucasArts with their graphic adventures. Early adventures reveled in killing the player, often for the most minor reasons. LucasArts realized this kept people from exploring as much as they needed to in order to complete the game - after all, if looking beneath a rock kills you, you're going to be reticent to take a peek under the next one. Also, it just wasn't much fun. The attitude spread, but you'll often still hear developers bemoan the fact that so few gamers actually complete their games. When Valve published their Steam stats from Half-Life: Episode 1, only half completed it - and it was only five or so hours long. In recent years, the deceptively cuddly LEGO Star Wars took the most radical, almost puritanical take on difficulty. It simply removed death, instead rewarding the gamer for showing greater levels of skill rather than hindering his progress. Jonathan Smith, in a previous article in The Escapist went so far as to describe children's distraught response to playing a difficult game as "fairly abusive." By contrast, LEGO Star Wars took great pains to ensure that failure wasn't merely tolerable - it was impossible.